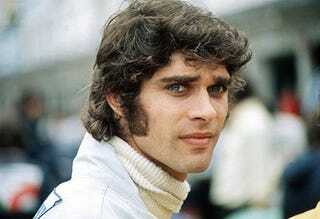 Remembering François Cevert, who would have turned 70 today. Today would have been the 70th birthday of one François Cevert, once dubbed 'The most exciting man in France' and team mate of Jackie Stewart at the Tyrrell F1 team between 1970 and 1973. Despite his short time in the world of Formula 1, Cevert was highly regarded as a very promising prospect and a fine exponent behind the wheel. It was a comment from Jackie Stewart to team boss Ken Tyrrell that got Cevert the drive in the F1 team, with Stewart telling Tyrrell to keep an eye on the talented youngster. With current Tyrrell driver and fellow French national Johnny Seroz-Gavin suddenly announcing his retirement (most likely down to an eye injury) Tyrrell acted on Stewart's recommendation and hired Cevert as his new driver. Stewart then mentored the young Frenchman, with the eventual goal of Cevert taking over as team leader when Stewart retired. Cevert began racing on his mother's Vespa scooter against friends, before reaching the age of 19 where he bought himself a Norton motorcycle. National Service then called for the young Cevert, but after the completion of his two year service Cevert turned his eyes towards four wheels, and in 1966 he took part at a training course at the school in Le Mans. Now very much into cars, Cevert took his driving to the next level by enrolling at the racing school at Magny-Cours. Whilst learning his skills at the course he won a scholarship with the prize of a season in an Alpine Formula 3 car, and prepared to enter his first season in the Formula 3 Championship. His first season in Formula 3 was not good. Lacking experience and funding Cevert struggled and his prize from the scholarship was not a competitive car. The following year he turned down a works Alpine drive and managed to get himself into the more competitive Tecno Formula 3 team. This proved to be a wise move as Cevert began to win races and by the end of the 1968 season, he was Formula 3 champion. In 1969 Cevert stepped up to Tecno's Formula 2 programme, Formula 2 at the time was the place to be if you ever wanted to be an F1 driver, many existing F1 drivers actually competed in the Formula 2 class and it was here Stewart took note of Cevert's ability. He ended the Formula 2 season 3rd in the championship, and now the big league was calling. However, 1970 was not to be a dream first season in F1. Working alongside Stewart, Francois became very close to both Stewart and his family and the two became close friends, Stewart himself saying he couldn't have had a better friend in Cevert. The foundations of a successful team relationship between the two drivers was in place, but on the track the 1970 Tyrrell cars (which were actually made by March) were unreliable and the two drivers struggled for points and finishes, Stewart eventually finishing 5th in the championship. The team mates only finished 5 races each, but Cevert was happy to take his first championship point at the Italian Grand Prix. The following season of 1971 was a hugely successful year for Tyrrell, as Jackie Stewart won his second World Championship, and Cevert completed his first full season in F1, taking 3rd in the championship behind his team mate and Swede Ronnie Peterson after some excellent results, most notably his first win in F1 at the final race of the season in Watkins Glen. Cevert also continued to race in Formula 2, obtaining good results. Now he was very much established as a top driver. After a forgetful campaign in 1972, Tyrrell and Cevert began preparing for the '73 season. 1973 was a fine year for Cevert, outside of F1 he helped guide MATRA-SIMCA to a World Constructors Championship in sports cars, and was again performing in Formula 2. Cevert's F1 season was also much improved, he didn't win any races but he obtained 6 second place finishes, half of which were 1-2s behind team mate Stewart. Lotus had the best car in 1973, but with their wins being split between their two drivers, Stewart took advantage and with simply excellent driving in the Tyrrell, he managed to take his 3rd and final world championship, failing to score points in only 2 races during the season. Sadly, Cevert was not to see the end of the '73 season. Jackie Stewart was to retire at the end of the 1973 season, but he had kept it quiet. The plan within the Tyrrell team was to make Cevert the new team leader, Stewart and Ken Tyrrell even planned to let Cevert through in his final race should he be leading, to somewhat symbolically pass over the leadership. He never had the chance though, as when that final race at Watkins Glen came around, Cevert was killed in a terrible accident during qualifying. He was 29 years of age. Tyrrell and Stewart withdrew from the race. Blessed with good looks, charisma and fantastic driving ability, Cevert was universally liked by the people around him and adored by women who encountered him. His death in qualifying at Watkins Glen denied the world a chance to see if Cevert could fulfill his great potential and challenge for, or even win the World Championship. He was known as a gentleman and was even a classically trained pianist. A friend of mine who was a Tyrrell mechanic at the time said he was often to be found playing piano with a beautiful woman close by. Unfortunately, François Cevert is just one of many drivers in F1 history who we lost. His good friend Jackie did much to change this. I don't know a great deal about the history of F1, but through talking to a man who knew him, and researching him online it seems he was really loved by all those he came across, and his loss at the age of just 29 affected those he was close to a great deal. On what would have been his 70th birthday, this seemed like a great opportunity to write about him, and for F1 fans worldwide to remember or learn about him. Instead of writing a conclusion, I'll finish this article leaving you with a few words from this short video of his great friend and mentor Jackie Stewart.